Welcome to RDRN's Peregrine Falcon web cams. This document contains information on Peregrine Falcons and the four camera views available at this site. WEB CAM HISTORY: 2010: The Red Deer River Naturalists (RDRN) with assistance from TELUS and Fish and Wildlife, installed a webcam in the nestbox at the TELUS radio tower located in the Highland Green subdivision in Red Deer, Alberta, Canada. The pair, Perry (female) and Windsong (male), laid 5 eggs and successfully raised three young: Scout, Telli and Nadira. 2 of the eggs went missing. 2011: three additional cameras were added to the nestbox, giving views of the outside of the box, as well as night vision. Improved sound was also added. The pair, Perry and Windsong were back at the nest and laid 5 eggs, none of which hatched. Because of better coverage by the cameras, we were able to see that the parents ate 3 of the eggs and 2 were considered "early dead." 2 young from Edmonton, Tiny and Taio, were fostered into the nest and successfully fledged from the nest. Perry was found dead under the tower in September of 2011. With assistance from TELUS, Perry and 2 of her eggs that didn't hatch were sent off for toxicology reports. The reports came back as inconclusive. The analysis showed that none of the key suspected poisoning agents (carbofuran, chlorpyrifos, or pyrethroids) were detected. However, whatever she had eaten contained a virtual cocktail of industrial chemicals including siloxanes (often found in soaps, defoamers, lubricants) and glycerine (lubricant). Siloxanes are known to bioaccumulate. The circumstances under which this bird was found and subsequent physical examinations strongly suggests that this animal was poisoned - unfortunately, we cannot conclude by what - there are too many industrial compounds to choose from. Perry was also not carrying inordinate residues of DDE, so her egg losses could not be attributed to pollutants. The toxicology report could not conclude why the eggs didn't hatch. NESTING AND RAISING YOUNG: The TELUS tower in Red Deer has been used for years by nesting Peregrine Falcons. Normally, peregrines nest on steep cliffs but they also can use tall buildings for their nesting sites. Their nests consist of only a scrape in the ground. They generally lay 3-4 eggs but rarely have as many as 5 or 6. The eggs are 53mm X 41mm and are laid at 2-3 day intervals. Most of the incubation is done by the female but the male will help out. Incubation doesn't start until the second or third egg is laid and lasts 28-29 days for a single egg. At this time, the male will bring food to the nest. Once hatched, the eyasses (as baby peregrines are known by) will be closely brooded and fed for the first 14 days by the female. After that he will feed the young if she is absent. Young begin to feather at 18 days and exercise their wings at 21 days. Mom and dad tear off bits of prey to feed the eyasses but later on the eyasses will tear up the prey themselves. They fly at 35-42 days but will stay with the adults for another 2 months. PHYSICAL FEATURES: Adult Peregrines are a little bit smaller than a crow; the females being larger than the males. Males and females look identical with both having the black "teardrop" and the dark bluish-grey crown, back, and upper wing surface. The throat is white, the underparts are white to buff, and there are blackish-brown bars on the sides, thighs, abdomen, underwings, and lower breast area. In flight, Peregrines look considerably different from hawks as they are more streamlined with relatively small heads and long pointed wings. Their wings are shaped to allow quick flying. LIFE SPAN: It has been recorded that captive peregrines can live up to 20 years, but life spans in the wild are typically much shorter. DIET AND HUNTING: They eat mostly birds but sometimes feed on mammals. Sometimes they catch their prey after spotting it from a perch or while flying. They may even fly very low over the ground, taking prey by surprise. Most often they hunt by flying very high then diving (stooping) to strike prey out of the air. The peregrine has been called the "fastest bird in the world", for good reason; they can dive at speeds over 300 km/hour. A stooping Peregrine's feet lie back against its tail and hold its wings half closed. When dealing with a medium to large-sized prey, the Peregrine usually hits the prey with a half-closed foot during a dive. They will then either carry it away, or if it is too large, let it fall to the ground where they will land beside it to feed on it. Smaller prey can be caught in mid-flight with their talons or, like the larger prey, they will knock it to the ground as well. Often they are unsuccessful when going after prey for a variety of reasons: the individual Peregrine may not have all the skills necessary, or the prey species is particularly agile. Another reason is that cover may be available for the prey to hide in. They have powerful talons and their hooked beak has a notch or “tooth.” They use this tooth to cut the spinal cords of their prey. Their hunting ability is also enhanced by their acute eyesight. MIGRATION: During migration, they travel long distances. Their over-wintering area can be as far south as South America. In fact, the Peregrine Falcon was named for the lengthy migrations of some populations: “peregrine,” from the Latin peregrines which means “wanderer.” CONSERVATION STATUS: Peregrines were listed as “endangered” because there were so few breeding pairs in the 1970’s. A major reason for the population decline was exposure to pesticides. 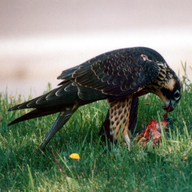 The pesticide level in Peregrines caused reproductive problems. The eggshells were too thin; thus the eggs weren’t viable and there were no young hatching out. Hinterland’s Who’s Who states: “Since 1974, more than 1,650 Peregrines have been bred in captivity at the Canadian Wildlife Service breeding facility at Wainwright, Alberta, at university-based facilities in Saskatchewan and Quebec, and at a private facility in Alberta. Staff from wildlife agencies and non-profit organizations have released the captive-raised birds from natural cliffs and tall buildings at over 60 sites from southern Alberta to the Bay of Fundy on Canada’s east coast. In 2005, there were more than 200 pairs of wild Peregrines breeding in southern Canada and more than 300 wild pairs in the Yukon and the Mackenzie valley. Over 7,000 pairs of Peregrines are now thought to breed in North America, including Mexico.” Peregrines were removed from the endangered species list in the U.S. in 1999 but are still listed as a species of concern in Canada. One subspecies of Peregrine Falcons is still listed as "threatened." THE NESTBOX, CAMERAS AND WEBSITES: The nest box was provided by Alberta Sustainable Resource Development (Fish and Wildlife Department) in the spring of 2010. It replaced the box that they had installed over a decade earlier. The primary difference between the old box and the new box was the addition of metal bars installed in the entrance which are designed to discourage predatorial birds from stealing eggs. Before the new box was placed on the tower, RDRN installed the single camera system. They also applied a heavy duty deck coating to the box to extend its life. The box was bolted through its floor to the top service platform grating of the TELUS communication tower and then a bed of washed pea gravel was added. The pea gravel provides material for the adult peregrines to construct a scrape, a safe rounded surface for eggs, and proper drainage. The nest box was placed 95 meters (312 feet) high on the main service gangway of the TELUS communication tower in Red Deer's Highland Green subdivision. The TELUS rigging crew was gracious enough to remove the center gangway railing in front of the nest to provide an unobstructed entrance for the peregrines. They also mounted the instrumentation package nearby which manages the transmission of the video and audio signals. They aimed the wireless links and did final focus adjustments to the camera. The success of the prototype web camera in 2010 and the need to deal with some technical shortcomings encouraged RDRN to work with TELUS to bring down the nest box after the nesting season so that upgrades could be made. In the beginning of April, 2011 the nestbox and associated equipment was raised to the main service gangway once again. It now sports four cameras providing views of two angles inside the box, night vision inside the box, and an external view of the box and its immediate surroundings. Two of the cameras inside the box are configured to provide a 3D signal. Two improved microphones and a thermometer were also installed inside the nest box. Because of the extremely inaccessible nature of the location, several redundancies have been implemented into the camera system. Almost every component has been doubled or quadrupled. The components have also been installed in a fashion that makes replacement in the field much more practical. To make maintenance easier, the roof has been modified to swing open on hinges. You may notice one of the carabineers which locks the roof down in the external view. You may also notice that the TELUS crew moved the nest box back a bit further on the gangway (presumably so it was more accessible for maintenance).We're hoping that this encourages the Peregrines to spend a bit more time in front of the camera. Also in the external view, mounted to the port side of the nest box is a gray junction box which holds all of the connectors for the cameras and microphones and the umbilical cable which connects the nestbox to the instrumentation package. Also mounted to the tower are the wireless links which communicate the video signals to our downlink site, 2 km away. TECHNICAL INFORMATION ABOUT THE CAMERAS: There are 4 cameras. 3 are located inside the nestbox and 1 outside. Each of the camera's audio channels is fed by one of two identical microphones located together in the top, back corner of the nest box. Each of the camera's signals is streamed on a separate Ustream channel in order to provide public access to a large audience. You can find each channel by entering the name of the camera into the search box on the Ustream website. Chat has been disabled on every channel except for the channel named "RDRN_PEFA_Nightvis" which is the main gathering site for our viewers.  If you are watching more than one RDRN channel at a time, we recommend that you turn the sound down or off on all but one Ustream viewing window so that you don't hear overlapping audio feeds. You may find that the sound comes to you later than the video. This is perfectly normal. When viewing more than one RDRN channel at a time, you may find that the videos seem out of sync. This is also normal. RDRN_PEFA_Stereo_Left: Mounted in tandem with the RDRN_PEFA_Stereo_Right camera, this camera provides the left portion of the stereo (3D) main view inside the box. At night it also exploits illumination from the towers navigation beacon lights and near infrared illumination from the night vision camera's LEDs to provide stunning day-like video. This camera also provides a view of the thermometer. RDRN_PEFA_Stereo_Right: Presently the channel for this camera is currently off line. If we get requests for 3D views, we will activate the camera associated with this channel. We may also activate it as a replacement channel if RDRN_PEFA_Stereo_Left is out of service since it provides an almost identical view. It has been mounted in tandem with RDRN_PEFA_Stereo_Left, this camera provides the left portion of the stereo (3D) main view inside the box. At night it also exploits illumination from the towers navigation beacon lights and near infrared illumination from the night vision camera's LEDs to provide stunning day- like video. This camera also provides a view of the thermometer. RDRN_PEFA_Nightvision: Mounted inside the nestbox across from the stereo cameras, this camera provides excellent color video during the day and near infrared video, translated to greyscale, at night. The intense near infrared illumination (which is invisible to the Peregrines) provided by its integrated LEDs provides for non-motion blurred, high resolution video of the interior of the nestbox after dark. RDRN_PEFA_External: This camera which is mounted on the tower's navigation beacon light provides an excellent view of what is happening inside and around the immediate area of the nestbox. The camera is sensitive enough to exploit illumination cast by the navigation beacon light in order to give an idea of what is happening outside the nestbox even at night. It also picks up some of the near infrared illumination cast inside the nestbox by the night vision camera. Use the Ustream channel for this camera to join in on the live chat. 3D: Although we have taken steps to make the nestbox 3D capable we have no specific plans at this point for implementing a 3D channel. The stereo feeds are available to the public so that those with the equipment or technical savvy can take advantage. We hope at some point to have the time and resources to provide a complete 3D channel for those who have 3D capable TVs or other viewing equipment. For more information about RDRN, Peregrine Falcons, or this project please visit our website at: rdrn.fanweb.ca.